with variations in flow-related forces (see, for example, references  to ). Similarly, fibroblasts must be highly responsive to the mechanical forces associated with alterations in the ECM (reviewed in Schwartz and Ginsberg ). Considerable evidence points to focal adhesions, the sites of cell-substrate contact, as the sensors of mechanical force. Central to focal adhesion assembly and function are the inte-grins, a family of a-P heterodimeric transmembrane glyco-proteins that provide essential adhesive functions for cell migration and the establishment and maintenance of normal tissue architecture. At least 18a and 8P chains allow for the formation of multiple integrin heterodimers that are able to display a spectrum of specificities for cell-surface adhesion molecules and for a range of ECM components, including laminin, collagen, and fibronectin. The integrin cytoplasmic domains bind a variety of scaffolding and actin regulatory proteins, which in turn recruit a large number of adaptor and signaling molecules. These physical links couple the inte-grins to the downstream activation of numerous signaling molecules, including MAP kinase, focal adhesion kinase, Src, and PI3-kinase (see, for example, references  and ). 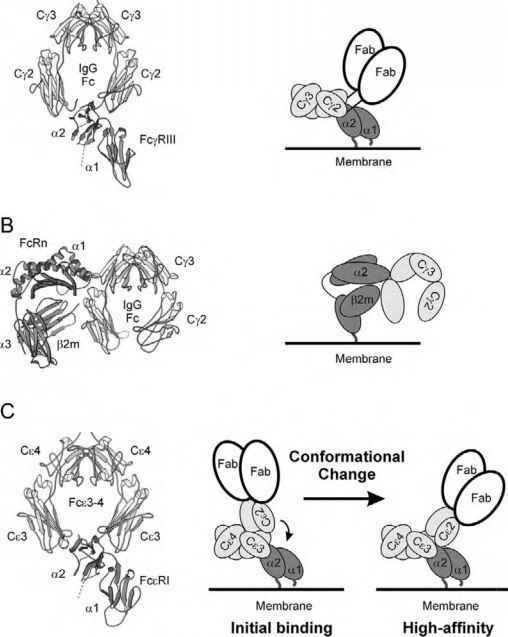 Furthermore, integrin affinity is modulated by the activation state of the particular cell in question, and this "inside-out" signaling is thought to control the tertiary and quaternary structural rearrangements required for high-affinity ligand binding. The focal adhesion may thus be viewed as a highly dynamic sensory organelle that exploits the direct linkage between the ECM and actin cytoskeleton to respond to mechanical force through a wide range of signaling pathways. Figure 1 Model for the mechanochemical signaling mechanism of integrins at focal adhesions. The extracellular domain of integrin binds ECM components, such as collagen and fibronectin. The cytoplasmic domain of integrin contacts a series of scaffolding proteins and cytoskeletal regulatory proteins (pink ellipse), including talin and paxillin, which provides a direct physical linkage between the ECM and the actomyosin cytoskeleton. Alterations in the ECM generate tension that may result in tertiary and quaternary structural changes (illustrated here as a scissor-like motion between the a- and P-integrin chains). These structural changes are propagated to the cytoplasm, which may uncover cryptic binding and recruitment sites for additional signaling molecules (blue ellipse). The ability to couple force generation to alterations in the composition of integrin-associated focal adhesion molecules provides a direct mechanism for mechanochemical signaling. and the intrinsic mechanical properties of the underlying ECM (Fig. 1). For example, the growth of cells on soft, or pliable, surfaces does not support integrin signaling nor the formation of focal adhesions , while "stretching" of these substrates supports both focal adhesion formation and integrin signaling [7,8], presumably by allowing for a sufficient level of tension to be achieved. At the molecular level, mechanical force may be transduced into a cytoplasmic signal through a number of possible mechanisms. The application of force may disrupt or distort various intermolecular binding interfaces, resulting in the reorganization of focal adhesions by enhancing the entry or exit of specific signaling molecules through either free or facilitated diffusion. A related potential mechanism is the force-induced confor-mational reorganization of integrin-associated focal adhesion molecules, which may uncover cryptic binding and recruitment sites for additional signaling molecules. This notion is consistent with the fact that a number of focal adhesion components, including vinculin and ERM proteins, exist in multiple conformations (see references  and  and references therein). Of special note are a series of structural [11-15] and biochemical studies (reviewed in references [12,13,16]) describing the localized ligand-induced conformational rearrangements and a model for integrin activation [12,13]. This model suggests that a large-scale conformational reorganization, including a scissor-like motion, may be required for high-affinity ligand binding. Some aspects of this conformational plasticity may also play a role in transducing mechanical force into cytoplas-mic signals. These mechanisms, whether affecting the dynamic assembly/disassembly properties of the focal adhesion as a whole or directing conformational reorganization of a specific focal adhesion protein, can provide a direct linkage between cell surface-ECM adhesive interactions, focal adhesion composition, and cytoplasmic signaling. Furthermore, recent studies demonstrate a complex relationship between valency and geometric organization of the ligand and the strength of integrin-associated signaling , suggesting some mechanistic similarities with the c described below. Thus, integrin-associated signaling provides one of the clearest couplings of signaling and the adhesive properties of a receptor-ligand pair.